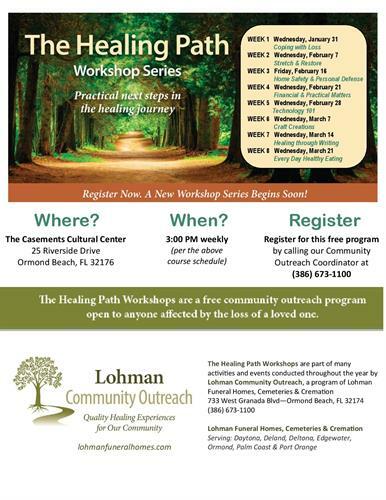 The Healing Path Workshops are a free community outreach program open to anyone affected by the loss of a loved one. Each workshop in an 8-week series includes a different speaker and a different topic of interest, all of which are focused on practical “next steps” in the healing journey. The Healing Path Workshops are part of many activities and events conducted throughout the year by Lohman Community Outreach, a program of Lohman Funeral Homes, Cemeteries & Cremation. January 31, 2018 at 3:00 pm through March 21, 2018 at 3:00 p.m.